Last Friday, I tottered to work in ginormous platform shoes, only to be nearly crippled by the time I reached my office. Comfortable, these shoes were not; they were both, oddly, too long and too narrow. By noon, I decided I couldn't take it any more, so I limped to the nearest shoe store, which happened to be Aerosoles. I figured my feet felt so bad, I didn't have much choice in the matter. Now, when I hear Aerosoles, I think of the ugly flats my mom used to wear in the '90s; I believe she had them in at least three colors. So I headed to the sale rack, figuring that if I'm going to buy a pair of shoes to wear for only a few more hours, they might as well be on sale. Lo and behold, there were actually several semi-cute pairs of shoes that would've worked for me, but I went with a studded, braided leather sandal with an espadrille wedge sole (they sound busy, but they're boho-chic and cute enough, considering the source). They were $30, but they were also so comfortable, I ended up wearing them all weekend long--I can walk in them for hours without the straps digging into my feet or the ball of my foot cramping. I feel like I've entered a whole new world. 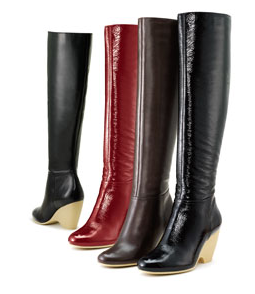 So I went on the Aerosoles website to see if they have any other passable options for fall. 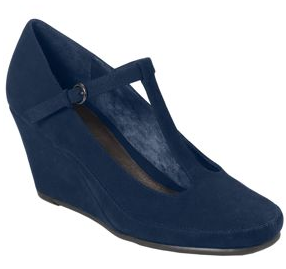 Wedges are on their way out, but you can get at least a season out of this T-strap, and the dark-blue color is a cousin of the trendy cobalt I've been seeing everywhere. While not totally my cup of tea, this lace-up bootie is a look you're going to see everywhere this fall. 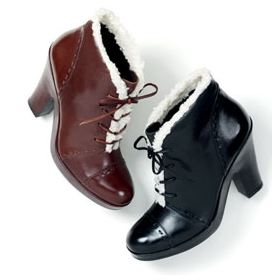 The faux-shearling trim gives it a cozy touch. I think my favorite style, however, is this knee-high wedge boot--you can even get it in edgy patent leather (trendy and waterproof!). So they're not Louboutins. They're not even Stevens. But when it comes to shoes you can actually walk in, Aerosoles has some surprisingly stylish options. Who knew? hey - did you see this!? aerosoles might be getting a lot more stylish, and soon!! Thanks for backing me up, ladies--it makes me feel a lot better about writing a post in praise of mom shoes!